Welcome to the CA-AAUP website! 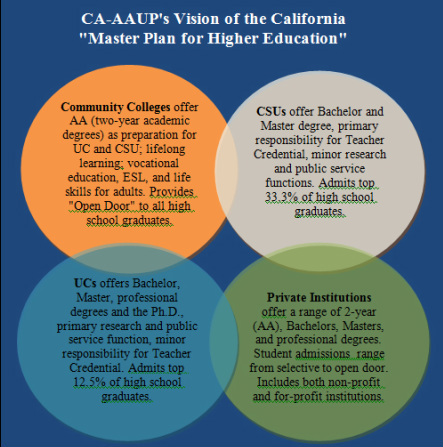 The California Conference of the American Association of University Professors (CA-AAUP), represents all four divisions of higher education in the state of California: community colleges, California State Universities, the University of California system, and the private colleges and universities. Together, we are California's higher education professionals: we are adjuncts, lecturers, graduate students, researchers, scientists, tenured and tenure-track faculty. With members at more than 130 universities and colleges across the state, AAUP leads the fight for academic freedom and shared governance, and for the respect we deserve as higher education professionals. Visit our Youtube Channel to learn more about the CA-AAUP. To learn more about the CA-AAUP, click on the links in the "ABOUT" drop-down menu on your left. If you have any questions, please email us. "I am proud to join the CA-AAUP steering committee at this juncture, because the battle for faculty rights, academic freedom, shared governance goes hand in hand with the battle for a fairer higher education system, which is also the battle for the heart and mind of this nation against the forces of bigotry and prejudice." "With the corporatization of public universities and the rise of for-profit private colleges, I think the CA-AAUP has an important role to play not only in supporting the faculty at California’s private universities in their quest to gain and maintain shared governance, academic freedom, and tenure but in helping build links between faculty at public universities, private universities, and community colleges. Such links will strengthen faculty voices in the curricular and administrative choices facing all institutions of higher education in California and in the public discourse over the future of higher education in our state." "In 2012, I agreed to join the CA-AAUP Steering Committee as Vice President for Community Colleges because I know that California community colleges are the beating heart of California's system of higher education. Community colleges are the open door for everyone who wants to learn and grow and succeed, and they need our support, now more than ever." "It was a great honor to serve as the President of CA-AAUP. I have the firm conviction that working with the California AAUP is the best way to protect academic freedom and keep higher education as a common good that will benefit our students and our communities. Education is a very powerful tool to bring forth the free expression of ideas and analysis that will promote social justice. As members of the California Conference of the AAUP, we will work together to maintain a high quality learning environment in our Institutions of Higher Education." I am proud to serve as Vice President for the University of California on the executive board of the California Conference of the American Association of University Professors. As someone whose academic career has spanned the spectrum from high school dropout, to community college student, to state university student, to land-grant university graduate student (University of Texas) to professor at UC Davis, I recognize and respect the enormous benefits our higher education institutions bring to our world. This is my motivation to do my best to fight for our universities.